Every so often I meet someone doing music who instantly clicks with my strange amalgamated personal interests. I love Music, Theology, Video Games, Writing, playing D&D, Reading, and amateur Falconing at the Prince Harith bin Muawiya bin Thour bin Kinda Falconry Club, among other things. Needless to say, it makes me happy when I can meet someone who shares my love of the same nerdy endeavors. One such soul is my new acquaintance Colt Hangen, better known as the vocalist of the band The Huxtables (whom we had the pleasure of playing with on our tour). Colt and I instantly began gabbing about video games at our show, and made grand plans to play some Day Z together even. In fact, I think Colt will single-handedly revive The Wolfpack by playing with me. As some of you may remember I attempted to get friends and Picture Atlantic fans on board with playing some Day Z together, but unfortunately all the e-mails I got in response were either “Wait, I have to buy the game?” , “My computer can’t handle that kind of graphics and computing burden!”, or “I told you already, I thought it was a video game based on the album “Watch The Throne!”. No Zombies here! 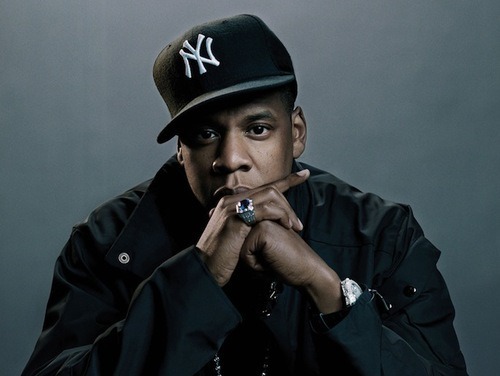 He is too financially sound to re-animate! Regardless, we added each other on Steam and began chatting away. 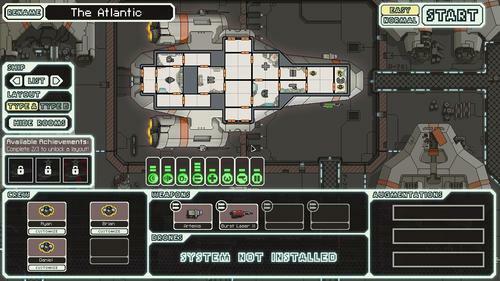 Colt suggested I play the game FTL: Faster Than Light. He even went as far to say that it is his favorite game of 2012. Nerds don’t say these kinds of things lightly. We are too elitist to christen every game with that kind of honor. With that I looked it up on the Steam store, saw it there for $9.99 and instantly bought it. “Wish me luck!” I said, as I entered the game for the first time. 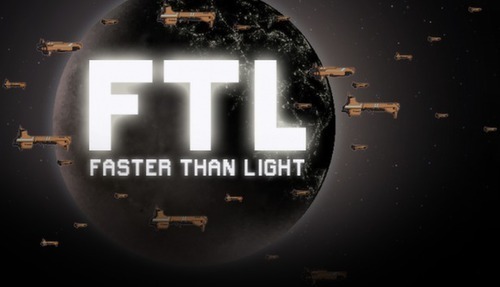 To give a quick run down of the game, FTL is a very difficult spaceship command simulator, where you control and command a small ship, sent on a dangerous mission to deliver vital information to your remaining fleet. The game is retro in aesthetic, and brutal in payout for failure: if you die, you start over completely. 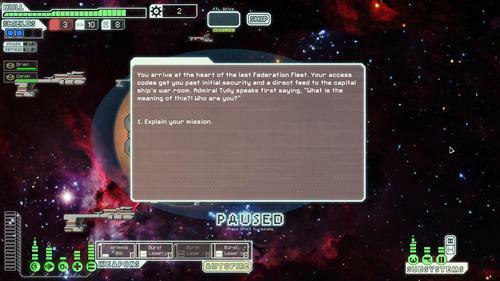 With that in mind, I will now take you through an embellished play by play of my mission to save The Federation. Sadly, you can only start with three crew members, so I will name my crew after the other guys in the band, and we can assume that I will play the invisible mysterious guiding hand directing our brave crew where to go. Eventually through trading with space people, and also obliterating dirty rebel scum, we managed to fully outfit our sweet ship with lots of lasers and shields. It was no easy task. We made Ryan do a lot of space ‘favors’ to get that last Flux Capacitor. Long story short a lot of crazy stuff happened, and eventually we got a new crew member! His name was Triko and he was some kind of Praying Mantis Alien from another dimension. I bought him for 50 space scrap. Yes, Mantis Slavery is still alive and well in this horrible galaxy, but I felt he would have a much better home aboard our ship helping us book shows, record demos, and fix structural fissures than work in the horrible spice mines of Kessel. 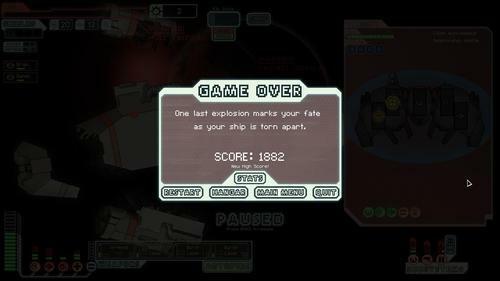 Sadly during a battle, the ship caught fire, and I ordered Triko to put out a fire on the Weapons deck all by himself. I stupidly neglected to command Triko to head to the Sick Bay for medical repairs during the ensuing inferno and he passed into Mantis Heaven. You know those Mantis, give them a task and they will really commit! 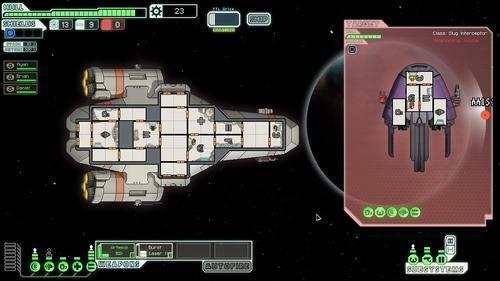 I had only one choice, which was to open the airlock, thus sucking all the oxygen on the Weapons Deck out into space, thereby smothering and extinguishing the fire. It also doubled as a quick and timely space burial for Triko’s insectoid corpse. Daniel played ‘Gangsters Paradise’ over the ships com in honor of his passing. Now this is where things really started to go bad! 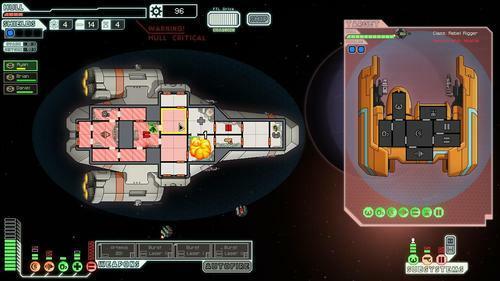 Yes, this picture is our ship being damaged in battle. Those red squares are parts of the ship that have no oxygen, and the tiny green dot in the middle of that is Ryan. Yes…sadly, Ryan passed on in his bold, and dare I say it, heroic attempt to keep our Weapons Systems online so we could destroy the enemy. Destroy the enemy we did! 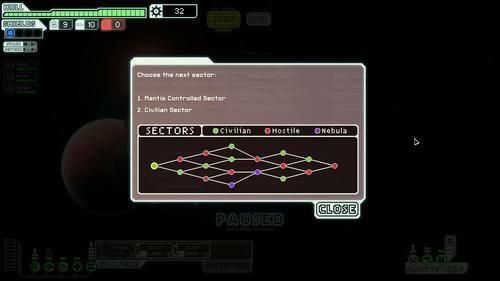 After we gave Ryan a burial in deep space, we headed on to the very last sector where we made contact with Fleet command! We were greeted as Heroes, Brian, Daniel and I (the invisible force that controls the ship). Mostly it was a slap on the back and “Here is some fuel and missile reloads”. That didn’t stop us from buttoning up our jackets, gritting our teeth, putting pedal to the metal, and soaring directly into the vast swathes of our enemies to strike fear into the heart of their very…. 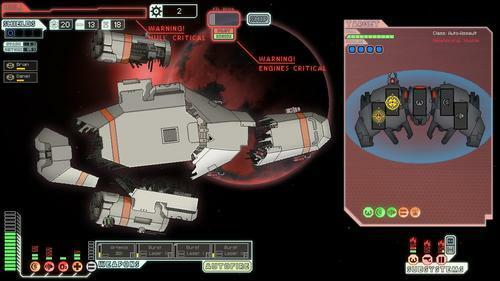 Oh…..huh…I guess you really do need a full crew to run a space ship effectively. As you can tell by the picture above, that separated, crushed mass of metal is our brave ship, The Atlantic. Our skill, technology, and skeleton crew were no match for the cunning lasers of our foes! Overall, it was a great adventure, and I am glad I embarked on it. I’ll be embarking on some more adventures soon along side Picture Atlantic into the world of video games, and I hope you can join us too! Keep looking to the staaarrsss!